This past Fourth of July weekend was pretty great. I walked dogs on the beach with three friends, slept in, went to a BBQ, read 250 pages of one of my all time favorite books, The Witching Hour (need to finish it before I go to New Orleans! ), and went to yoga. The highlight was my sew day, of course. I thought it was pretty cool that Curtis joined in on our sew day. It was my first time sewing with a guy! 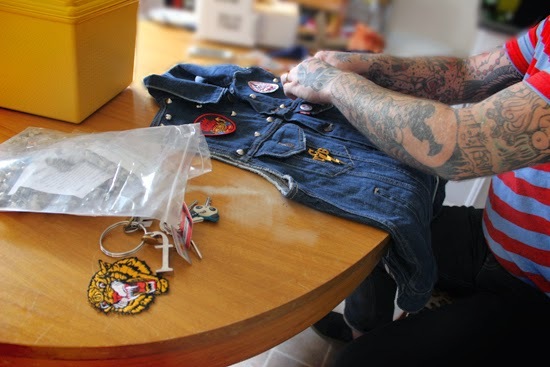 He brought along his denim vest and attached some studs and planned his patch layout. He is the singer for Magazine Dirty and wants to get his vest done before his next show this upcoming weekend. Curtis and I have been friends for many years, even longer than I have known my husband! He and Luke have been besties forever and I think of him and Jessi as family. I even call his mom my "Arroyo Grande Mom." Cool fact: Curtis was the one who came up with the name "Miss Crayola Creepy" close to ten years ago. Stella had fun with us too. Did any of you get some sewing done over the weekend? That looks like so much fun! I would love to have a sewing day with friends but don't really know anyone near me who sews. For a while I was organizing "Crafternoons" with fellow crafty friends and people would bring whatever projects they were working on, but I get way to frustrated trying to organize something for more than two or three people, LOL. I'd love to have a sewing day with friends but I don't know anyone :( so it's just me and the Vito. I did get lots done though and it was very enjoyable!! 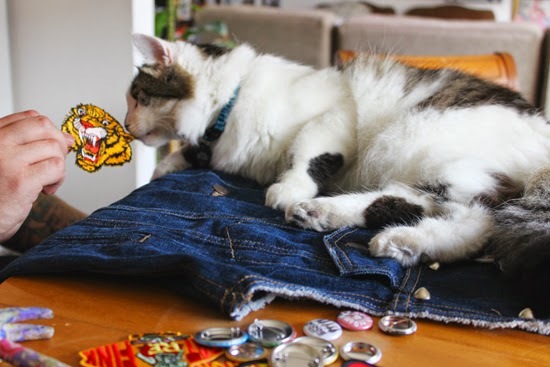 Vito is a good dude to sew with! "Crafternoons" sound cool! I really like that idea. 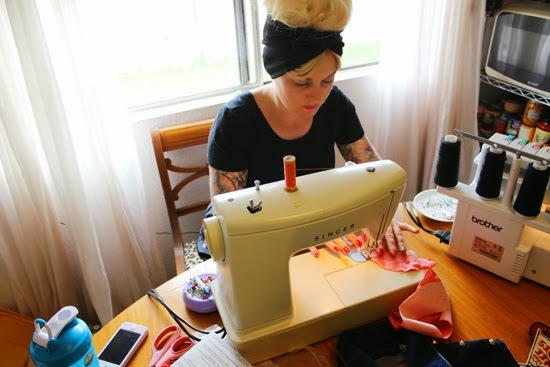 My house is so small, that I can only fit three people total at my kitchen table, so my sewing days are pretty small. And I hear you on the stresses of organizing bigger meetups! 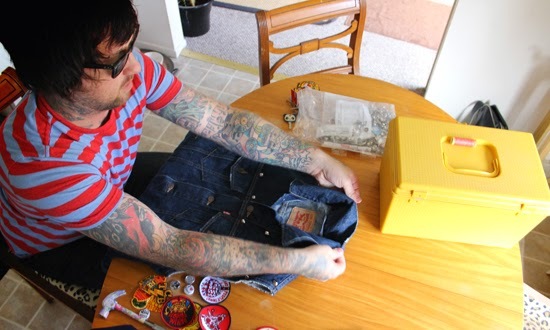 Love the Curtis trivia :) I have pictures of Curtis sewing a patch on with dental floss when I was visiting and sewing at their house--he's a good sport! I think it's awesome to sew something up and then immediately wear it out, haha! I had such a great time!! Thanks for having us over! Looks like a great time! I've been talking about having a crafternoon with a couple girls from work, this reminds me that we need to make a solid plan or we may never do it. The Witching Hour is SO GOOD! Every time I read that book I get transported back to when I first read it (think I was about 14?). Also, I get serious house envy and become desperate to wander round the Garden District again! Also, I think I need to try to encourage some friends to come over for a sew day - that just seems so fun! I love that you had a sewing day with friends, such a good idea! It would be so motivating to be sewing with someone else. What a fun sewing day! 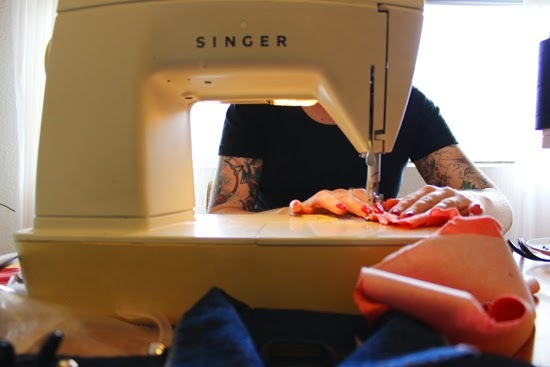 It's SO much more fun to sew with other people (although I have to confess, the few times I've tried to have "sewing days" with other NYC peeps, we've done WAY more talking than actually sewing, ha!). Also, hi, Jessi!!! We met in NYC earlier this year! Perfect way to relax over a long holiday weekend! I'm not very good at watching movies while sewing - I get distracted and it always ends up with the seam ripper coming out. Aww this looks like great fun! Love that Stella got in on the action too!